Our mission and corporate values are focused on striking the right balance between an urban dwelling and harmony with nature. We promise you an unparalleled living experience and long-lasting edifices. Your quest for a home that offers an idyllic balance between the excitement of a city life and the pleasures of a secluded private life is about to reach its culmination. 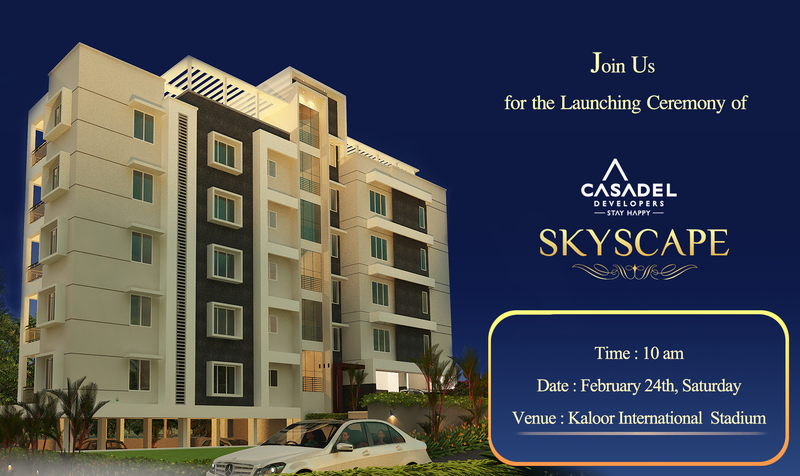 At the booming IT hub of Kochi; Infopark Phase 2, Kakkanad, a living space that caters to the nuances and sensibilities of your modern lifestyle is taking shape.As one of the best builders in Kochi Casadel developers provides Villas for Sale In Kakkanad. Set amidst an illustrious villa project that spans over 2 acres comprising 21 villas and an extensive play area, Skyscape is all set to become the newest and most exciting lifestyle hub in the region. By offering apartments ranging from a compact size of 483 Sqft to a spacious 1298 Sqft, Skyscape lets you put your preferences first when choosing your apartment. Apart from its closeness to Kochi's thriving IT hubs, Skyscape is enviously positioned amidst a number of upcoming and ongoing infrastructural advancements like Gems international School, Software Technology Park of India, Kochi's First Imax theatre, Metro terminal, several Star hotels etc. Also, the ease of access to multiple healthcare facilities, educational institutions and other conveniences, make Skyscape the most sought after residential destination in Kochi, today.